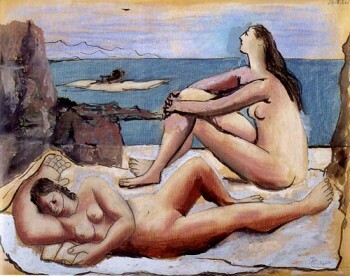 This celebrated work, now in the New York Museum of Modern Art, is part of series painted while was with his young family in the Fontaineblueau in the summer of 1921. It marks a return to high Synthetic Cubism and his enduring Commedia dellArte imaginary, commenced in the early days in Paris. His continuing association with teh refined world of ballet, through his wife and through his work designing sets and costumes for Diaghilev, is evident throughout. Three Musicians is a large painting measuring more than 2 meters wide and high. It is painted in the style of Synthetic Cubism and gives the appearance of cut paper. Three Musicians is an example of Picasso’s Cubist style. In Cubism, the subject of the artwork is transformed into a sequence of planes, lines, and arcs. Cubism has been described as an intellectual style because the artists analyzed the shapes of their subjects and reinvented them on the canvas. The viewer must reconstruct the subject and space of the work by comparing the different shapes and forms to determine what each one represents. Through this process, the viewer participates with the artist in making the artwork make sense.